These ‘Observations and Comments’ combine illustrative personal observations of a deaf Border Collie (BC) dog and her hearing mother in our home and vicinity, with an collection of anecdotes from the DeafDogs Yahoo Internet group. Section 4 lists ‘best’ books and training DVDs. Our deaf BC is a spayed female three and a half years old. She was born on a sofa in our home, raised under our kitchen table and in the immediate surrounding areas. Her deafness was confirmed by empirical tests, such as her failure to react promptly to loud noises near her, by age eight (8) weeks. Both her mother and father possessed a ‘white-merle (risk) factor’ such that one or more of their pups possibly would be one-ear deaf or totally deaf (both ears). Possible deafness would be preliminarily indicated if the respective puppies were almost totally white color and later as they grow up exhibit a black-spotted light colored coat (Dalmatian style “freckles” or “merle” coat). Although until recently popularly mislabeled “a deaf-white gene,” white coat color is not always the case. What is the case is that for deaf puppies, with BC’s it is that areas around the head and ears, are white but they can have a lot of black on their backs. With Australian Cattle dogs, the coat is very light colored, blue or red, not dark, and deaf cattle dogs have virtually no spots or patches on them despite the presence of the high probability of deafness Dalmatian gene that brought in deafness when the Australian Cattle dogs breed was being made. For Koolies it is the merle gene. Deaf dog mantra:1. It’s a dog,2. It has a breedand the breed traits,3. It has its own personality,and 4. Way way way way last, – deaf with ears that are ornaments! Many unpleasant misleading or false myths exist about deaf dogs. According to various Internet reports, the US AKC currently (2010) discriminates against participation of deaf dogs in their main activities. Our experience indicated that, among the general public, the representative forms of negative emotional reaction against deaf dogs ranged from expectations of severe mental incapacity to at best irrational expectations of viciousness. The most common reaction was to treat a deaf BC as a “Throw-away” toy to be used up and discarded, or discarded immediately. As documented via the Yahoo Group and my observations, nearly all of the myths are misleading with a tiny kernel of fact or entirely false. Except for using conventional ear-hearing, deaf dogs are capable of all activities of hearing dogs. In addition, some deaf dogs engage in activities that may be unusual among hearing dogs. Further, living with a deaf dog reportedly often enhanced the lives of their humans. Your dog ignores you (just as hearing dogs do) by turning her head away, but for her shouting doesn’t help at all. Your dog doesn’t care if her favorite toy has a ‘squeaky’ or not.But she discovered that the squeaky ball really irritates her hearing mother! Instead of listening for your car, your dog watches for headlights on the wall and can tell your car’s lights from your spouse’s. Stomping on the floor doesn’t mean you’re angry. You notice Christmas bells in the craft store and immediately think “What a great size for the dog’s collar!” and buy a box of 24. You find yourself looking at the sky, ceiling, etc., trying to figure out what it was that your dog saw there. Your dog watches your hands intently, trying to decide if you’re talking to him and what the motions might mean. People argue that your dog can’t be deaf, he’s paying very good attention, is responsive and well trained, and his ears move. You unintentionally do your “good dog” hand signal to your coworkers, spouse, dogs and cats. You find yourself making exaggerated hand and arm motions to get any dogs’ attention, instead of making kissy, smoochy noises. You ask them to sit or lie-down with your hand instead of your voice. Your other dogs learned all the deaf dog’s hand signals by osmosis. Not only that, but they wait for the hand signal after the vocal cue, like they don’t believe you really meant it until they see the signal. Your dog either ignores the vacuum-cleaner sounds or thinks it’s a great thing to play with. You talk on the phone and to your dog without a breaking the conversation. The same for a sore throat. You can enter your house with an armload of groceries, sneak into the kitchen, and unload them – all before your dog knows you’re home. You can get up to go the bathroom in the middle of the night and your dog doesn’t wake up. If you are really sneaky, you can get up and be completely ready for work before letting your dog out of her crate. You can look forward to July 4th and New Year’s Eve because the noise doesn’t bother your dog.It also doesn’t take hours to coax your dog out from under the bed after a thunderstorm.Your dog has no noise anxiety! When someone rings the doorbell, your dog continues to sleep (people think he’s so well-behaved). You can walk your dog down the street without stopping as the neighbors’ dogs bark while you pass by. When the “Twilight Bark” starts up, it skips your house. On the other hand, your dog will wake up in the dead of night to bark at a light she saw, and upset the dogs in the neighborhood for nothing. Your hearing dog apparently for amusement stands directly behind the deaf dog, and in a series of barks escalates the volume until the deaf dog wriggles her ears and looks back for the dog who has bad-breath. Your neighbors and friends long ago forgot which of your dogs is deaf, and so speak and sign to both. Your deaf dog makes unusual (for her breed) verbal sounds when excited or dreaming, such as 1) yodeling, 2) mooing like a cow, 3) screaming like a banshee when she gets too excited to remember to bark like a hearing dog. Your deaf dog is fascinated by human ears, and investigates them when she can, but ignores the ears of other dogs. Summary: Deaf dogs have ears for ornaments, and are otherwise normal. Their humans if decent people, accept and enjoy the unique aspects of living with a deaf dog. Ear-Hearing is apparently important to early socializing of puppies: As described by Scott and Fuller, 1965, puppies learn from each other about the age of three to eight weeks that they must use a soft-mouth [gentle-inhibited bite]. K Lorenz, “King Solomon’s Ring”1952 and “Man Meets Dog” 1953 mistakenly believed that an inhibited bite was exclusively an evolution-fixed action pattern (FAP) genetic instinct like imprinting among certain birds. He was wrong, as documented in 1965 by Scott and Fuller. If a puppy is unable to hear the screams of its play-victims, and its own screams when play-bitten with needle sharp puppy teeth, it may less quickly learn to use an inhibited bite.Thus a deaf puppy is at risk of being less well socialized, abused by sibling puppies as a rough social deviant, and either timid and passive or oppositely chasing and mistreating other puppies.A knowledgeable dog-mother such as Lace with her third litter of puppies used parenting to instill proper social behavior in a hearing or deaf delinquent puppy, or a knowledgeable human can participate in the parenting to ensure all of the puppies learn to use an inhibited bite and treat each other decently. Unfortunately neither puppies nor human babies arrive with an owner’s manual, so occasional first time mothers are less effective in educating their offspring to use an inhibited bite and play nicely together without bullying.Our experience with Border Collies suggested that at any age dogs are able to learn an inhibited bite and appropriate dog-dog behavior.However, a 100 pound human trying to teach a 75 pound juvenile dog to stop doing excessively fierce nipping and biting may perhaps find herself engaged in a difficult process if the dog has learned to enjoy controlling the actions of other dogs and humans.In such instances, regardless of whether the dog can hear or is deaf, the aid of a professional trainer accustomed to educating poorly socialized large dogs should be sought. Startle Reflex Education: Dogs and humans who are unexpectedly touched, or even worse – kicked – will characteristically react with a ‘startle reflex’ by looking around and possibly instinctively defending itself against an apparent ‘attacker.’ Ordinary ear-hearing puppies quickly learn that sudden noises and touches typically are a sign that something good is about to happen, such as breakfast with mother. A deaf dog also can quickly learn that being startled is good. Properly raised puppies teach each other to react with inhibited bites to sudden touches, and that even being knocked over isn’t a satisfactory excuse to abruptly severely bite somebody.BC puppies we observed began about an age of four weeks playing learning-games that we called “puppy bumping.”Apparently for play-amusement, a puppy ran across the floor to collide with and knock an unsteady sibling off its feet.Sometimes a ‘tussle’ ensued with the puppy play-attacker and the play- victim engaging in much mutual vocalizing, nips and exchanges of ear, fur and tail pulling. Thus a deaf puppy may be educated by its siblings to react enthusiastically and happily by nipping at a presumed play-attacker when as a “play-victim” the deaf puppy is startled from a sound sleep, or caught in a position where it didn’t see the attacker arriving.If a deaf puppy isn’t socialized to manage its startle reflex, it might have a tendency to embarrass itself by nipping at a friendly human who touches it to wake it up for its dinner. Numerous if not quite all deaf dogs as reported on the Internet are easily educated that any sudden disturbance is probably a clue that something nice is about to happen. An exception was of course the reports of deaf puppies and juveniles who were taught by a human that a startle-sudden disturbance means they are about to be severely kicked or injured.Eventually perhaps mistreated puppies will defend themselves, run away, or die.People with deaf dogs DELIBERATELY wake and train their dogs to wake up happy and to never wake up and nip anyone. ‘Velcroing’ by deaf dogs and seeking to calm their startle reflex: Our deaf BC, and according to reports on the Internet most other deaf dogs, discover a technique that humans call ‘velcroing.” Typically a deaf dog as a juvenile, and some as adults, chooses when sleepy or asleep to keep direct physical contact with their favorite human or a chair the person might be sitting on.The deaf dog has learned that the slightest movement of the person or the chair signals that something interesting is about to happen, so the dog should wake up and become alert [The world needs more ‘lerts. ]Many dogs later learn that lying across a door, if that is the main exit/entrance will ensure that the dog knows when its human goes past.Some humans and other dogs will learn to play ‘games’ on the deaf dog by sneaking stealthily past the sleeping dog, leaving the deaf dog to awake later and wonder where the others went.Deaf dogs are typically much attuned with ‘air movements’ e.g. if the dog is in a crate and an outside door is opened, the dog will usually wake up because it senses the changed air movement and human fresh smells. Non-ear hearing by some deaf dogs: Our deaf BC at about eight months age was observed in the presence of talking human to stand on a sofa with her forehead lowered to press against the cushion she was standing on. She had discovered that she could detect and ‘understand’ vibrations by touching or standing on vibrating surfaces.Later she discovered that she could ‘listen’ to the vibrations of a telephone-voice-recorder when she played back the recorded messages, with her chin touching the machine.Similarly she could ‘listen’ to a small radio by placing her chin on the top of its case. She never placed her chin on those objects unless they were playing voices or radio at a significant loudness.As anyone might know who has observed ripples on the surface of a beverage in a flimsy paper cup, or felt with their finger tips the vibrations of a small radio’s case, etc. – sounds can cause touch and air-movement pressure-touch sensations by moving the skin, fur/hair/clothing, external portions of ears, and of course dog-whiskers. Thus owners sometimes confuse themselves into hoping that their deaf-dog has recovered some hearing, when actually their dog has cleverly discovered that various vibration and pressure sensations of their body parts have significance about their environment. Analogously, some blind humans are able to extract information about their surroundings from comparing the modulation and arrival times of sounds directly received from a source versus those sounds reflected from the surroundings before the sounds arrive at the person’s ears. Convincing reports of hound dogs using radar-like location-hearing processes at night were reported on the Internet recently. Such indirect (not by their inner-ear) detection of sounds by a deaf dog can be mistaken for inner-ear- hearing if the source of the sounds is a human or another dog at close range- perhaps several feet away.For example, our deaf BC micturated within seconds of her mother doing so, despite an absence of sounds and perhaps as much as fifty feet downwind between them. I also observed our deaf dog being summoned by her mother who stood behind the deaf dog at a distance of about two feet and barked several times with increasing loudness until her daughter looked over her own shoulder to see her mother, and hopped up to follow her away. Both non-ear hearing and olfactory detection of her mother’s dog-breath might have alerted the deaf lass that it was time to move on. Dog-Human Sign Languages: Puppies learn to understand the body-language, vocalizing and odors of other dogs, and their humans, much as human babies learn to understand adult humans and other children. A deaf puppy necessarily omits learning the meaning of inner-ear sounds, and thus tends to focus on understanding body language, including hand gestures of humans, and olfaction- smelling. Thus deaf puppies are predisposed to learn from humans a “gesture language” such as American Sign Language (ASL) or one of ASL’s international variants.A fine trainer, Virginia Broitman, taught our deaf dog all the basic signs. Routinely deaf dogs acquire at least an elementary language capability consisting of verbs [get, come, lie-down, etc], nouns such as ball, Frisbee, rope, names and so forth; and adjectives that describe a specific noun-object such as for example “short” rope, and “long” rope. Complex gestures such as those describing a path to be run to get a specific object are routine. Thus human communication to deaf dogs with a version of sign language is common. ASL is not international, as it is mainly used in America and Canada.Australia and Britain have a different style of hand-sign language.In Australia it is called AUSLAN and the hand-signals are different than ASL. Humans also use their own obedience hand signals, and invent ‘made up’ hand signals.ONE HANDED signals are best, to always keep one hand free for holding a leash, groceries, etc. In addition to the ‘classic’ hand sign languages, deaf dogs expect from their humans the important face and body language, e.g. HAPPY, relaxed, smiling face and a very loose fluid body. Conversely ‘scolding’ is usually done by just using ANGRY, pinched face, glaring eyes and a very ‘stiff’ body posture. Deaf dogs, like hearing dogs, carefully watch and respond to face and body language, before we usually even realize. Reciprocal communication to humans by gesture signing of dogs is feasible and can be routine although such training of dogs is sparsely documented.The work and publications by Sean Senechal should be consulted for the best of such research currently known to me.Owners of deaf dogs reported many casual anecdotes of their customary reliance on ad hoc informal dog-“sign-gesture”/ “body-language”-language dialects mutually developed among the associated humans and dogs. Dog-dog reciprocal communication using body-language is routine, although some hearing dogs are said to momentarily experience a little apparent confusion about unusual or unorthodox verbalizing by deaf dogs when initially encountering a deaf dog.Our hearing BC and her deaf daughter BC illustrated that. When my deaf BC used inappropriate ‘fierce’ vocalizing at first when engaging in rough rope-tug play with me, its hearing mother BC scolded the deaf dog, until after several events the deaf dog softened its vocalizing. Our deaf juvenile BC routinely accepted that other dogs have an “extrasensory perception” that permits other dogs to understand what humans want done – commands and events – without looking at the humans although the deaf dog is apparently unaware of how that is communicated from the human to the other dog(s). Our deaf BC frequently looks briefly at her humans and the other dogs for clues about what her behavior should be. For example, when our hearing BC is tracking a squirrel through the tree tops, the deaf BC is carefully watching the hearing BC to determine what is going to happen next. Our deaf BC was an early “experimenter” on other activities interesting to her. For example, she discovered that humans can kick the ball with their foot, for her to chase and retrieve.She initially explored the issue of how far away; perhaps as far as 10 meters outdoors, she could place a retrieved ball for the human to kick it again. She apparently preferred to force the human to go to the ball, probably so that she could run to a distance before the ball was kicked, i.e. delaying the kick for her convenience. She also probably by observation learned that she could place a retrieved ball near a human on an angle-azimuth to control the direction to where she desired the ball to be kicked.Indoors she often placed a ball near a person’s foot for it to be kicked, in preference to placing the ball in a human’s hand. She personally only throws a ball with her mouth, or pushes it abruptly with her muzzle, and almost never pushes a ball with her paws to make it move to a human. Unusual and “classical” vocalizing by deaf dogs: Perhaps it is well known that many deaf humans may encounter difficulty in learning to speak clearly, because they are unable to perceive the sound of their own voices. In addition, research of bird songs reported that apparently birds are hatched with a “template” of the natural songs of their species.Further research demonstrated that juvenile birds refine their songs by modifying or embroidering their templates on the basis of species songs that they hear as they mature, with the result that each flock may have a unique song-dialect. Digital recordings of four (4) litters of BC puppies, by two mothers and three different fathers indicated that at birth, within seconds, puppies vocalized human-recognizable proto-barks, whines, and “lost- puppy” chirps, plus miscellaneous trills, humming, et al.Each litter at birth possessed a collection of vocalizations that was readily distinguishably and unique compared to the other litters.Such birth- vocalizations within seconds of entering the world, I assume are based on instinctive breed or species “templates.” Internet reports suggested that some dogs can learn to imitate vocalizing of other dog breeds, such as reported of a BC raised with raccoon-hunting hounds. Our hearing BC was initially able to imitate and exchange special vocalizations with other local dog breeds when she was adopted by us, but apparently gave up that activity when nothing of interest to her was derived from the activity. Our deaf BC when she is apparently calm and deliberately barking vocalizes much like the barking of her hearing mother.However, when the deaf dog becomes very excited, she uses high pitched “yodeling-screams.” As a juvenile she “yodeled” when very excited during play, as for example running through a water sprinkler. She didn’t observably elevate her head or take a specific posture when yodeling. When waking up she usually makes a single “mooing” sound of about a second duration, quite like the “lowing” sounds made by dairy cattle.That kind of vocalizing has been stable for at least three years. Our hearing BC never vocalizes when waking up from sleep. Our hearing BC occasionally vocalized while asleep, and almost always used sounds that fit her recent activities such as chasing squirrels, or playing soccer.The combination of her leg motions and vocalizations permitted human observers to clearly distinguishable between soccer and squirrel chasing.In contrast, our deaf dog when asleep occasionally made unique “soft” sounds somewhat like her moo sounds. I concluded by observing our deaf BC and our hearing, that BCs probably are born with breed and species specific templates at least for proto-barking, whines, and “lost-puppy” chirps but can at least as an adult also learn to vocalize other sound patterns, even imitating human words and phrases. General social behavior of the deaf BC was similar to that of our hearing BC, and closely agreed with the discussion in the research paper “The Social Organization of the Domestic Dog” by Alexandra Semyonova, available here at Nonlineardogs.com. No unusual activities of the deaf BC involved smell-olfactory actions. The basis, if any, of a deaf BC dog’s possibly being more or less interested in smells than a hearing BC couldn’t be evaluated. Deaf dog ear ‘motions and postures’ signifying their direct of interest, intensity of attention, etc were indistinguishable from the comparable actions of hearing BCs. Our deaf BC and our hearing BC quickly learned to remain within their unfenced yard, which is bordered on two sides by heavily traveled sidewalks and suburban streets.Both dogs routinely attempted to persuade passing adults and children to participate in a game of soccer. Although Internet reported anecdotes plausibly suggested that deaf dogs can be trained more easily than hearing dogs of the same breed, I didn’t observe a significant difference in ease of training between the deaf and the hearing BC; both learn quickly.Our deaf dog received all her basic sign language training from human females and at age three+ years she continues to learn more quickly from women. Deaf dogs in Australia are not discriminated against as is done by the US AKC.In Australia deaf dogs can compete at all levels in all dogs sports, e.g. obedience, rally, agility, herding, tracking, Frisbee, pointing/ gun dog, lure coursing, etc. and also as therapy dogs.It shows the AKC and its people how backward that organization appears to be for deaf dogs and their humans.Also a deaf border collie competed at CRUFTS in the United Kingdom in agility in 2010.They are events and things that will encourage people to ‘THINK’ and that is needed to permit deaf dogs to live and perform with their humans as thoroughly and happily as hearing dogs with humans. 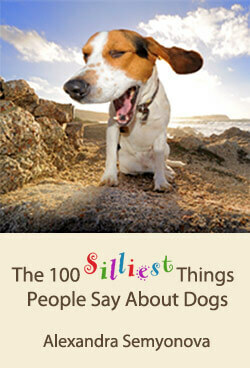 “The 100 Silliest Things People Say about Dogs,” Alexandra Semyonova, 2009; Hastings Press, England; NOT a Children’s Book. If you have questions, comments, or would like more sources on deaf dogs, please contact us. We’ll answer as well and promptly as we can and all queries will be kept private. See also: Deaf Dogs Forever, an excellent science-based site about deaf and blind dogs.